Textured nail polish is the new crackle I guess? I can say I love this new trend! So much amazeballs!!! 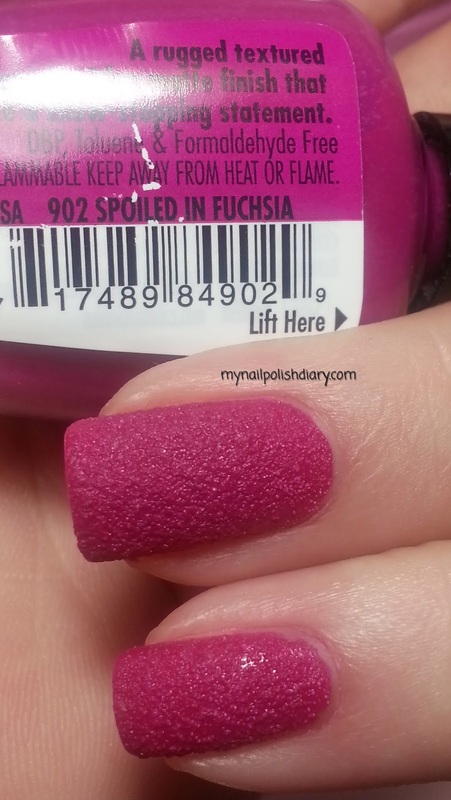 Milani Spoiled In Fuchsia is from the Milani Textured recent release. I love this color, I love the texture. It's a total win! I bought three of the colors from this collection and I can't wait to try all three of them. If the other two are anything like this one, I am thrilled. The application for this polish is super easy and smooth. I used my regular style of applying polish. I didn't use all my usual basecoat and treatment. Since these dry different from regular polish I only used Poshe quick dry base coat. I then apllied two even coats of SIF letting the first coat dry before applying the second. About five minutes or so. No top coat of course. The mani was completely dry within twenty minutes or so. It did not take long at all. The end result looks a little like leather to me. Complete adoration. I love the look, the feel, the wear...everything about it. The feel is much like the OPI Liquid Sand and Zoya Pixie Dust. Doesn't bother me at all. In fact I can't stop feeling the texture. I'll be buying three of the China Glaze Textures when they come out too. With the China Glaze colors I feel like I'll have a nice variety of color to choose from when I want to wear a textured polish. The only thing I feel like I'm missing in these textured polishes without gllitter (ie: OPI Liquid Sand) is a black shade. I know Nails Inc. has a black. It's a $25 price tag, and while I don't mind paying for something I want, it seems a little steep considering the price point on China Glaze and especially Milani. Maybe someone else will come out with a nice black. If not, I can see myself paying the $25 for the Nails Inc. so I can feel complete.